Students of St Mary’s School in Northampton are part of CEWA’s Low Fee Initiative project. Photo: Amanda Murthy. Providing a quality, accessible and affordable faith-based education, while supporting families from diverse backgrounds and financial needs, are key commitments of Catholic Education Western Australia (CEWA). 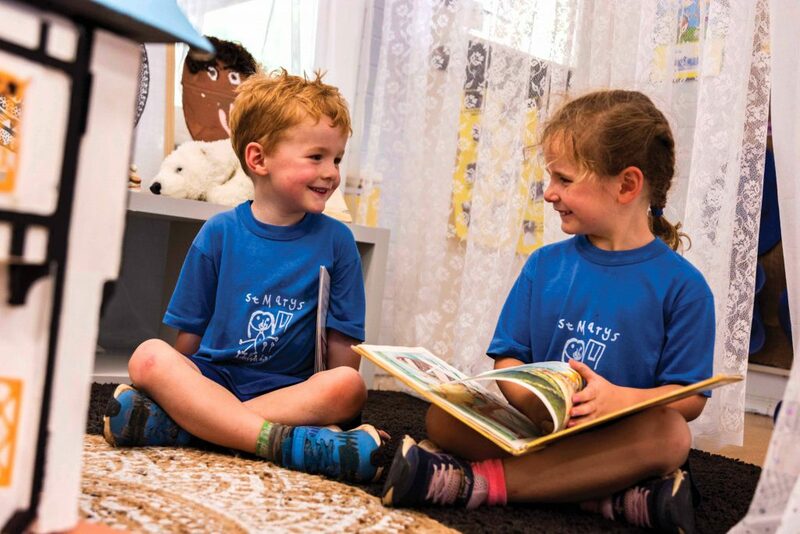 In considering the financial pressures that many Western Australian families continue to face, the Catholic Education Commission of Western Australia (CECWA) has introduced a low fee initiative that is enabling a Catholic education for children whose may otherwise not be able to access it for financial reasons. The initiative, being offered at six primary schools in selected urban and regional areas, aims to reduce the burden of fees for parents in communities with high financial needs. 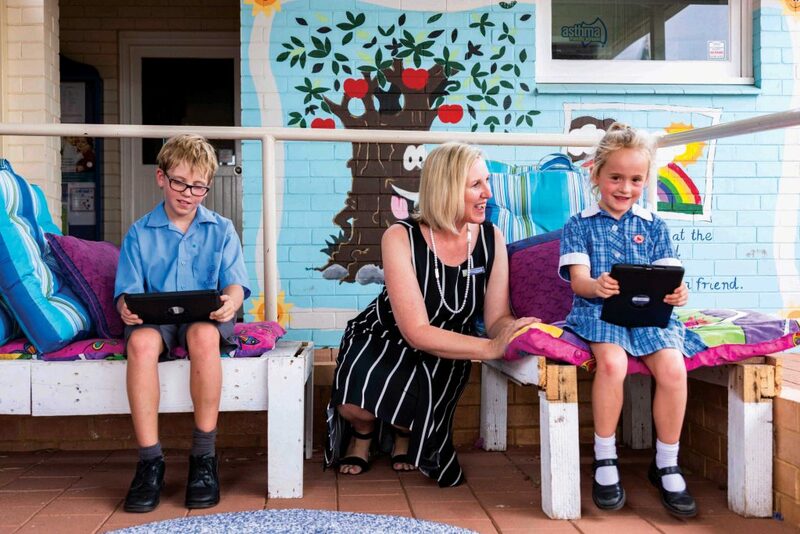 “This initiative builds on the imperative laid down in the Bishops’ Mandate to make Catholic Education accessible to all families seeking a Catholic education for their children,” says CEWA Executive Director Dr Debra Sayce. The Perth schools selected are Majella Catholic Primary School in Balga, St Gerard’s Primary School in Westminster and Our Lady of Mercy Primary School in Girrawheen. The regional schools selected are St Mary`s School in Northampton, St Joseph’s Catholic Primary School in Pinjarra and St Joseph’s School in Waroona. St Mary’s School Principal, Melissa Marquis expressed how proud and grateful she felt to be one of the schools selected for the launch of this initiative. “Now fees are no longer a contributing factor for the students’ families, because for just $10 a week, the children in Northampton can receive a quality Catholic education at St Mary’s School,” Mrs Marquis cited. “I’m glad we have this opportunity as this initiative returns to the grassroots of why Catholic schools were first formed – to provide a Catholic education for all families who seek it for their children. “For us at St Mary’s, this CECWA initiative is a way of supporting parents, and removing financial barriers that may prevent their child from enrolling at or attending St Mary’s School. “This initiative sends a very clear message to the community that St Mary’s School is centred on the needs of the community we serve.” the Principal added. St Mary’s School Principal and teachers are confident the Low Fee Initiative will help relieve the financial burden among their students. Photo: Amanda Murthy. Mrs Marquis expressed that the staff at St Mary’s had always worked hard to build positive relationships with their students, by applying the Early Years Learning Framework principles to ensure the children have a sense of Being, Belonging and Becoming. 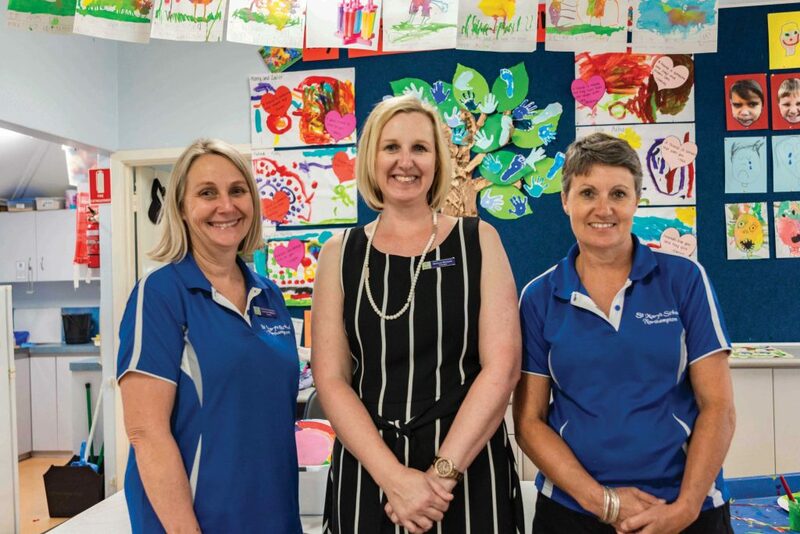 “The staff also work hard to provide a high level of pastoral care for all students because in a small town, community is everything and as a school in a small community we play such a large role in the triangular relationship of family-school-parish,” she stated. “We are aware that many students have long bus journeys to and from school each day, are affected by the farming seasons of seeding and harvest, the positive role sport plays in the children’s lives, and we acknowledge that support is required. “So having a benefit such as the Low Fee Project in our school, definitely places us one step closer to fulfilling the school’s desire of providing our students with the same educational opportunities as their city counterparts – we are so blessed,” Mrs Marquis concluded. School Board Member and parent Angela Cripps added the program required a substantial amount of planning and discussion. “I feel it has had a tremendous and positive effect on our schooling community – from a parent’s perspective, we now feel confident our children can continue their education at St Mary’s without any financial burdens,” she said. St Mary’s School Principal Melissa Marquis said the Low Fee Initiative places her school one step close to fulfilling the school’s desire to provide our students with the same educational opportunities as their city counterparts. Photo: Amanda Murthy. Dr Sayce told The Record the pilot project had seen the reduction of fees to $300 per child, from Kindergarden to Year Six, since the beginning of this year. “It’s important that parents understand that a reduction in fees will not equate to a reduction in standards and levels of education at these schools. This initiative has been prioritised by CECWA as an important means of providing equitable access to a Catholic education for any family who seeks it for their child,” she said. Dr Sayce added that sibling discounts were also available for students of all Catholic schools, and that fees are reviewed and updated by CECWA on a yearly basis based on changes to inflation. “This new program is already gaining traction with families in these communities, but more importantly it is providing many children with access to the high-quality and diverse learning experiences that we offer,” she said.